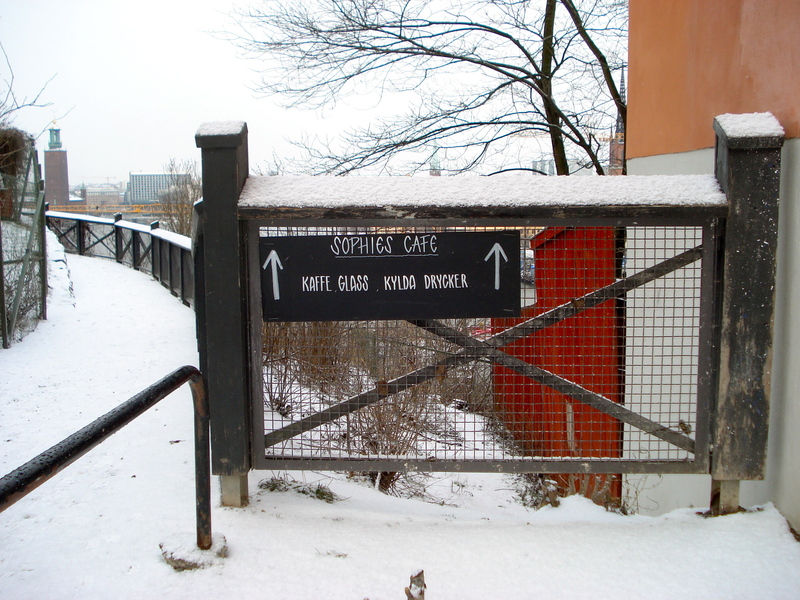 Sophies cafe: I miss you little sister! 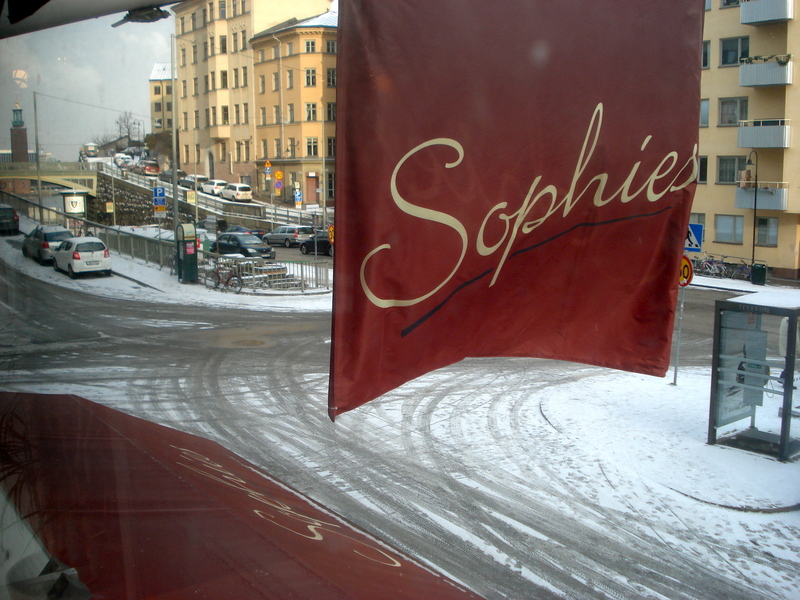 Sophies is located on the corner of one of Södermalm’s busiest streets: Hornsgatan. I spotted the place as soon as I moved into my flat as it is right by the grocery store and the recycling station. It attracted my attention because my sister’s name is Sophie! While Sophies is on a busy street, there is very peaceful way to get there: Montelius vägen. 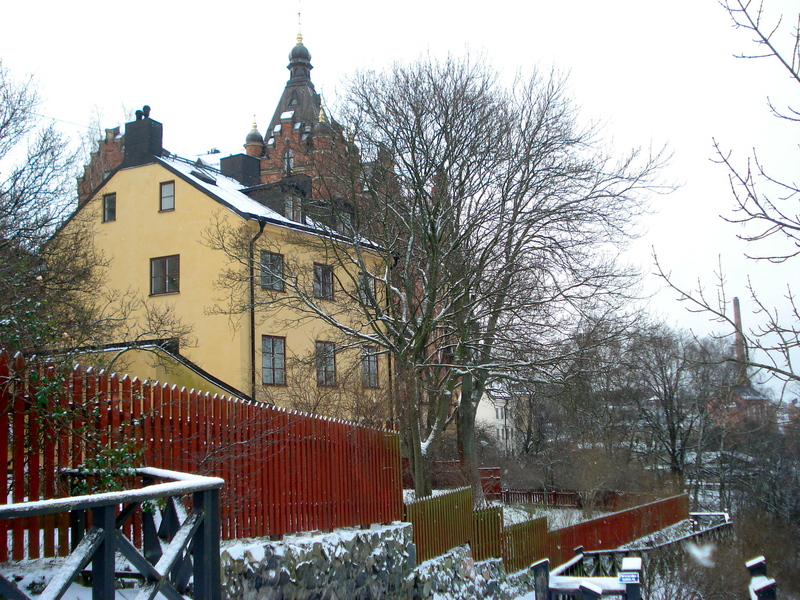 From this little path on the cliffs of Södermalm, one has a spectacular view on Gamla Stan and Kungsholmen. Seen from outside, it is hard to imagine what to expect inside Sophies. The ground floor only has a small counter and no tables. Right by the door there is a tiny staircase leading to the first floor (second floor for my North American friends!). The first floor is fairly large with what appears to be a set up to serve buffet for lunch on weekdays. Sophies was pretty quiet this morning. Other than me, only a young couple were enjoying a lively discussion over coffee. Unfortunately my Swedish is not good enough so when they stood and the guy started doing some moves I couldn’t tell if he was showing the girl a new dance or some tae kwon do moves! The guy didn’t really pay attention to me but the girl seemed a bit shy during that short public performance. Apparently Sophies was opened by mother and son Marita and Marko. Not quite sure why it is called Sophies. I guess I will have to ask next time I go there. 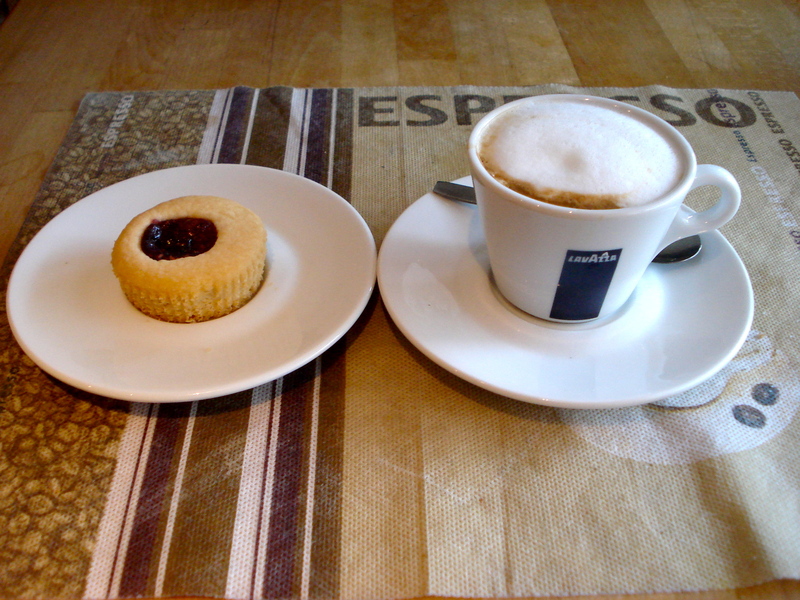 I wasn’t really hungry this morning but I nonetheless had some kind of a raspberry shortbread with my cappuccino. The coffee was good but I could have done without the sweet. 4 Responses to Sophies cafe: I miss you little sister! Great photos! And, how sweet that the name of the cafe reminds you of your sister! Here is hoping she can get there soon so you can take her there. 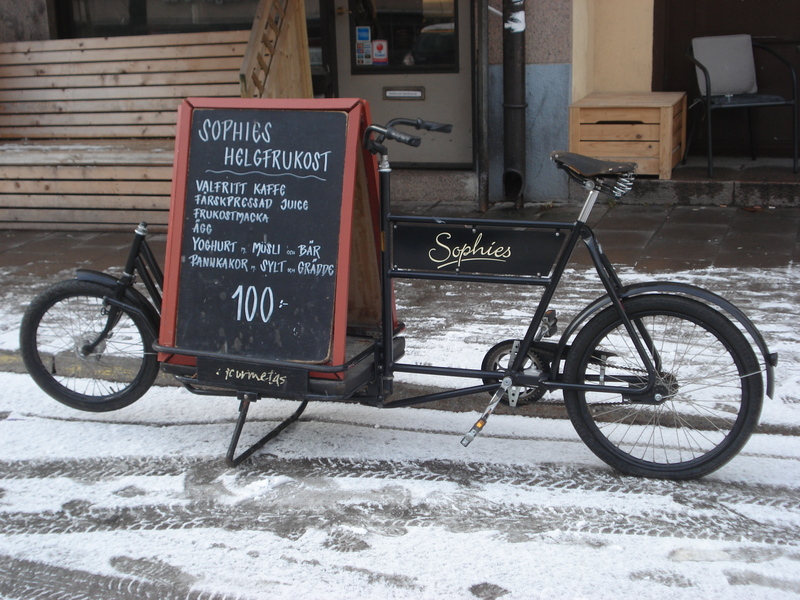 I love that bicycle shot…how cool that it serves as the sign holder! Thanks! 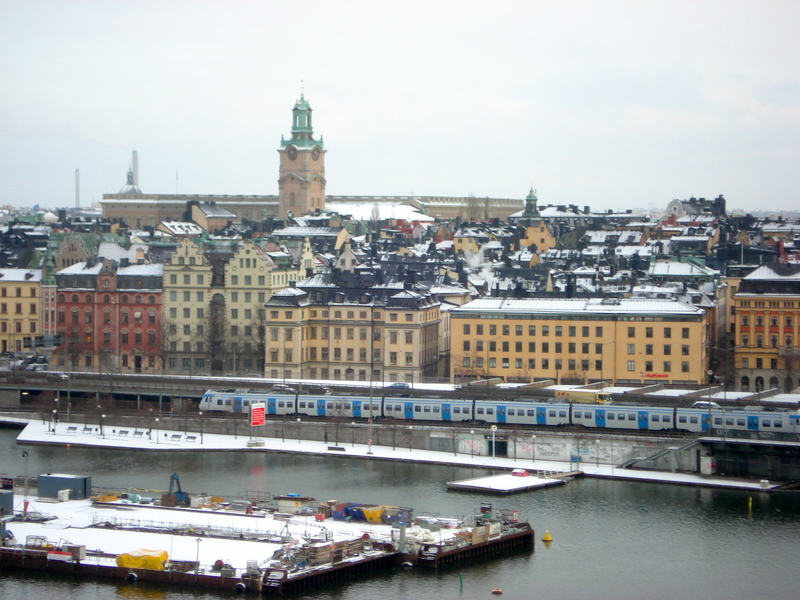 Stockholm is really a beautiful city. I hope that my sister will visit soon. I also love that the bicycle serves as a sign. One of the coolest café signs in town!